Incorrectly labeled chord. Is this a dominant seventh? I am trying to analyse this but am confused by the chord marked Am7. Am7 shouldn't have a D in it and doesn't make much sense in the context. Could it possibly be a D7 with the G being a suspension of sorts? It actually feels like it never leaves G in the first bar. The labeled chords seem to be ignoring the bass, but I think it's relevant here. The C in the melody is just a transition between B and D, and the A in the left hand (this is a piano score, right?) is a transition between G and B. It definitely doesn't feel like going to Am than back to G. I would label the whole first bar as G.
The Am7 "chord" is really just passing motion, and the whole bar has a G in the bass. I would label all four beats of that bar as a G chord. The combination of notes at beat 3 aren't a bona fide chord. But I think of those kinds of chord symbols as meant for guitar players and not real analysis. Some might say it's a Gsus4 because of the C being included and the B being absent. I don't like that label as the supposed suspended C doesn't resolve to B instead it moves up to D. That is a retardation. If you must give it a chord symbol it would need to be Gsus4add2 which is really awkward. If someone insists on a Am7 base chord, then it should at least be Am7sus4. I think it would be OK for a guitar accompanist to just play G on all four beats if a chorus were singing all the notated parts. Otherwise, just play what the arranger put on the page. Guitarists: play a Am7 on beat 3. However, these chords are written to help the musicians improvise an accompaniment. The arranger wanted to capture the passing motion in the accompaniment, rather than have it remain a static G. And all the important tones of an Am7 are present: the A, C, and G.
Personally, I would probably make the chord an Am7add4, as I like having the passing motion reinforced in the bass--though I would also alter a lot of those chords. I see no reason not to just use the chord arrangment from Beethoven's original. *You'll also note that the penciled harmonic analysis does not copy the Bm (iii) chord or the Am (ii) chord, but correctly calls them I6 (G/B) and V7 (D7) chord. The chords chosen in the accompaniment are unusual, to say the least. **It is not a sus4 chord, as the 3rd (C) is still present. There is no such thing as a minor suspended chord. Are there never more than 4 notes playing at any given time? If so, I'd guess this is a score for a SATB score (Soprano, Alto, Tenor, Bass) or for a similar formation. If that is the case, the notes are for the four chours voices to sing and the chords are for whatever instrument plays with them (usually an organ, a keyboard or a guitar, since this looks like a church song judging by the few visible words). 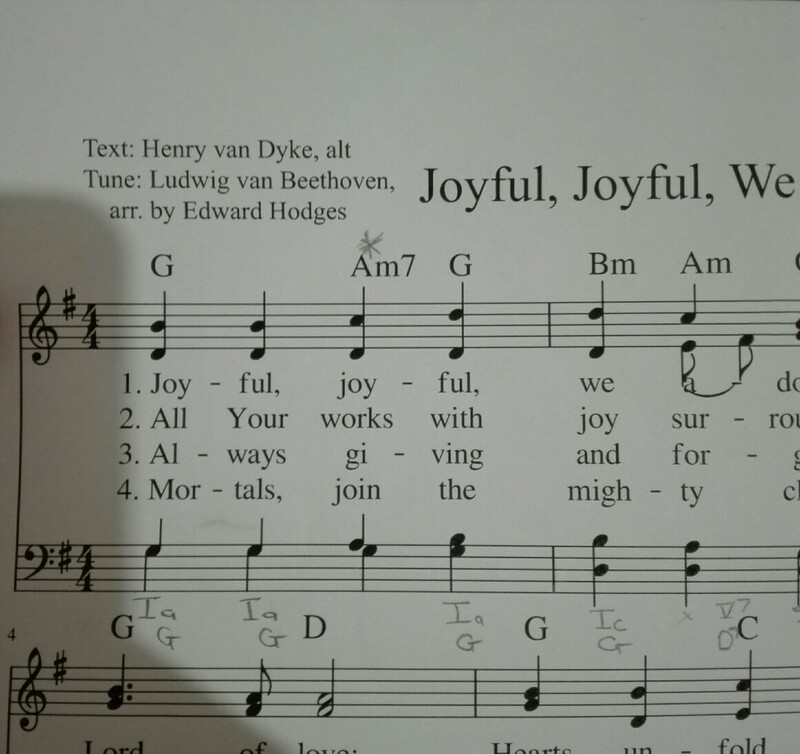 As such, the chord names above the score are not supposed to represent the notes played by the choir, nor the contrary is true. In other words, the chord names are not labels for the notes in the staves and there's no error to correct and no (further) mistery to solve. There is no expectation that the notes played by the choir perfectly match those played by the instrument, as long as they play well together. a, c, e omitted-the 5th of seventh chord, g = a minor 7th. d is pedal tone, a non harmonic tone. Not the answer you're looking for? Browse other questions tagged harmony chord-progressions analysis or ask your own question. Is this a C chord or an Em chord? What can a dominant seventh over a submediant chord resolve to? How tell when chords are separate entities and not parts of one prevailing chord? Can this note be analyzed as a non-chord tone? How can one analyze this chord progression from “Vienna” by Billy Joel?